September | 2008 | Whoisliz? A) As mesmerizing as the Ricky Gervais/Steve Carrell bit was on the Emmys, the best part of the show was Steve Martin’s tribute to Tommy Smothers. (Mind you, only these two parts of the show were good. My feeling is that rather than sitting though this dreck, it would have been more entertaining watching the awards being given out at the technical ceremony a week earlier.) He is why people want to be a comedian. It doesn’t get any better than lines like “Being here tonight is a big thrill for me because as a kid I use to run home from school and get all dressed up and play 60th anniversary Emmy Awards.” The YouTube version is here, embedding not allowed, but it’s realllly funny and worth a watch. B) We went to see Ghost Town this weekend – so good! It was sweet and funny and dare I say our entire party admitted to misting up at a certain montage toward the film’s end. I mean, we went to see Jeff in it, but as it turned out, we totally didn’t need to sneak out of the theater after his part was done. And who knew that he would get a whole article written up about his character’s backstory today on NYMag…exciting! I swear he told me Naked Guy died in the shower, but his new personal history is more entertaining. Jeff Hiller Tells The World How He Died Naked. People. You know my love for all things Fraulein Maria. 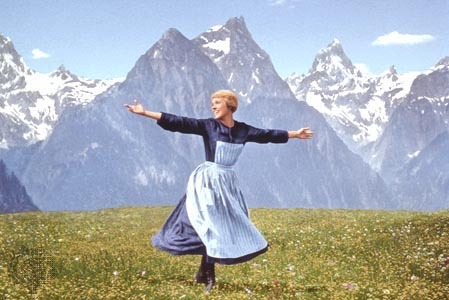 I love Julie Andrews more than a sensible person should. Which is why this news that she will be starring in a film with The Rock is a bitter pill to swallow. Dress him up and called him Dwayne Johnson if you must, but I remember the day when every guy who lived in my dorm would ask if I could smell what the Rock was cookin’, and I never thought that there would be a Venn Diagram connecting that aroma to my edelwiess-loving Julie. Read and weep, like I did. In this picture, our heroine is stuck on a mountaintop with no umbrella while a career shitstorm brews in the distance. Estrogen-loving companion and I have been having some pretty heavy Gilmore Girls DVD marathons these days. Last year for my birthday, he, Roommate Jeff, and Glennis pitched in and got me the entire seven season box set which, if you haven’t seen it, is the most insane box set ever and comes in a big plastic case that looks like a Barbie carrying case. Not joking, I think they made it look like that on purpose, it even has a handle so you can carry it to important meetings and such. It makes you remember all the good times and backstory that make the later Dean/Luke/Christopher subplots all the more satisfying – please note, my dear companion, I didn’t spoil anything here for you, I’m JUST sayin’. Also, I’m writing a bit at the Funny or Die blog this week too if you’re interested.